Xantrex’s XPower PowerSource Mobile 100, a name I don’t plan on repeating ever again, will lend some juice to 3 of your gadgets at a time. It only weighs about a pound. 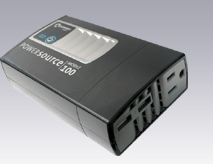 This gadget goes above and beyond the airline/car inverter from a few days back. It comes with a DC car and airplane adapter for when on the road, just like the airline inverter. And instead of just one AC plug, this has one of those and then 2 USB ports. Those USB ports can be used to charge your iPod, PSP, Blackberry, Palm, or anything else that has a USB charger, which are becoming more widespread these days. Many 3rd parties offer USB chargers for gadgets if you don’t have one already, just do some searching. You can expect to get about 2 hours of laptop life, 3 hours on a portable DVD player, 12 hours on a PSP, 44 hours on a regular iPod and a whopping 72 on a Nano. Sure, it might add a bit of bulk, but that’s a lot of juice. You’d get a full charge in no time. Some good safety features are built in: over-temperature shutdown, low battery voltage shutdown, overload shutdown, and grounding. Also, a blue LED will tell you whether or not the device is functioning properly. Unfortunately it will not make toast. Hopefully that’ll come in the next version. For about $100, the PowerSource Mobile will keep up to 3 of your gadgets fully charged/powered on those dreaded trips that simply won’t end.